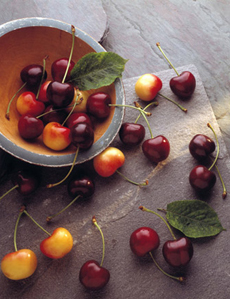 With a short harvest season, cherries are a rare and sought-after fruit. 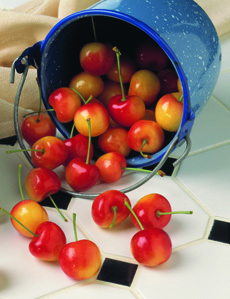 Photo of Rainier and bing cherries courtesy Washington State Fruit Commission. This is Page 1 of a four-page article. Click on the black links below to visit other pages. Life is just a bowl of cherries...the cherry on the cake. Cherries—sweet, rare, and seasonally limited—have been a prized item since before recorded time. Like so many delectables, they’ve entered our common language in an important way: beautiful and delicious, they’ve become synonymous with the best of the best. If you don’t believe me, feel free to ask anyone who ever bought a car off the lot in cherry condition...only to find out that it was secretly a lemon. In the United States, there are more than 1,000 different varieties of cherry tree, almost all of them blossoming over a three-week period in late May and early June. Of those 1,000, only about ten varieties are produced commercially, but they’re put to good use: every tree produces about 7,000 cherries or, if you prefer to think about it in real terms, about thirty pies’ worth. The American crop of more than 300 million pounds of cherries—of which almost 75% come from Michigan—has no shortage of health benefits. Like most fruit, they are fat-, sodium-, and cholesterol-free, and they are also a particularly good source of Vitamin C and potassium. Rich in bioflavonoids and other antioxidants*, raw fresh cherries maintain many of their antioxidant qualities if frozen immediately after harvest. Luckily, freezing not only preserves but also concentrates and improves the taste. 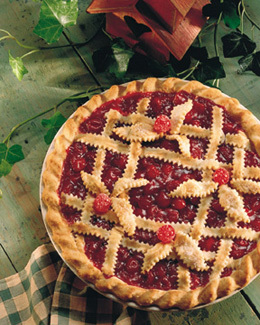 Each cherry tree produces about 30 pies’ worth of fruit each year. Photo courtesy Cherry Marketing Institute. Darker cherries have higher antioxidant and vitamin levels than lighter ones, but sour cherries, which are generally bright red rather than a darker red-purple in color, have far higher levels than sweet. *Read more about antioxidants and of the health benefits of sour red cherries. The two main species of cherry throughout the world are the Prunus avium, or sweet cherry (also called wild cherry), and the Prunus cerasus, or sour cherry (also called tart cherry). Growing on tall trees that range between fifteen and thirty meters tall, both varieties occur broadly across Europe and Asia, and there is no cross-pollination between the two. The wild cherry—also known as the sweet cherry—is largely cultivated across California, Oregon, and Washington State, and popular varieties include the Bing (named for a Washington state horticultural foreman) and their genetic offspring, the Rainier cherry. Rainier cherries. Photo courtesy Washington State Fruit Commission. The Rainier cherry is famous for its creamy yellow flesh and its high price tag, as most of the yearly crop is picked off by birds before it ever has a chance to reach your table. Another well-known sweet cherry is the Royal Ann, which is better known in its preserved, dyed and sweetened form as the maraschino cherry, used to garnish cocktails and desserts. Authentic maraschino cherries are made from a different species, he Marasca cherry (Prunus cerasus var. marasca), a type of sour Morello cherry that grows largely in Bosnia, Croatia, Herzegovina, northern Italy and Slovenia (although the tree is likely to have originated in Central Asia). With a bitter taste and a drier pulp than other cherries, it is ideal to make cherry (maraschino) liqueur, in which the maraschino cherries were originally preserved as a delicacy for royalty and the wealthy. 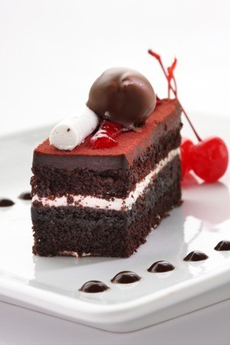 Black Forest cake with maraschino cherries. Photo © Photosoup | Fotolia. Since the Marasca cherry is very particular about where it will, other sweet cherries must be used to meet the world demand for “maraschino” cherries. Sour cherries are popular for use in pies and general snacking by people who prefer a more tart taste (the fruit is actually more fragile than sweet cherries, and harder to come by). 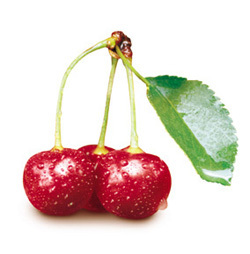 The most popular sour cherry variety is the Montmorency, which accounts for more than 95% of the sour cherry market, followed distantly by the Morello and Early Richmond varieties. Montmorency cherries. Photo courtesy Cherry Marketing Institute. The tartness gives the fruit more complexity and an acid backbone for cooking: Sour cherries’ origins strongly point to origins around the Black and Caspian seas. 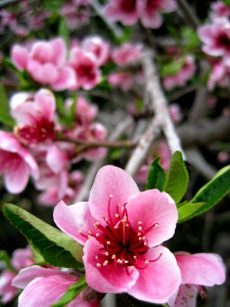 In addition to their wonderful fruit, the cherry tree is known for its beautiful flowers. In particular, Asian varieties such as the Japanese sakura (known colloquially as the cherry blossom and featured extravagantly in Washington, D.C.’s eponymous festival, are well-regarded for their long, weeping branches filled with small pink flowers. The more floral trees often produce tiny berries unsuitable for consumption; for this reason, many cultivars replace the tree’s natural stamens and pistils with additional petals to create a more beautiful—albeit sterile—tree. Beautiful cherry blossoms. The flowers can also be white, depending on the subspecies of tree. Photo by Sam Weng | SXC.